The microwave is a workhorse in the kitchen, but it often doesn't get the chance to show off its grilling capabilities. A good grill that is manufactured for the microwave can prevent soggy crusts on pizza slices and sandwich squares and keep meat from turning into a rubbery reheated mess. However, the grill function has caused some microwave users to pause. The metal shelf that comes with the microwave is often pulled out and left to gather dust in a corner or in the garage. However, the rack that comes with the microwave unit can perform a lot of duties. The grill rack or plate that came with the oven is required when using the grill function of the microwave. This is important because the rack that came with the microwave unit has been tuned to that specific frequency. If you use a metal rack in your microwave oven that is a replacement or didn't specifically come with the unit, then it can cause the appliance to spark and potentially catch fire. Remember to never put metal in a microwave unless it specifically says it's okay to do so. The gleaming metal rack that is placed so snugly on the pegs along the top half of the microwave has been tuned to the metal that makes up the cavity of the oven. The plastic or rubber clips that hold the metal rack to the sides of the oven make it safe. No arcs of electricity will form in your oven when you use the designated microwave grill rack. The flash that you see when using metal in a microwave that hasn't been previously tuned at the factory comes from electrons. The microwave uses electrons to heat the food in the unit. When the electrons meet the metal, they bang against the unknown surface. For other items, such as food or wet rags to be warmed that are placed in the microwave, the electrons pass right through the item. This heats the item up from the inside out without damaging it. The electrons in your microwave are designed to be high enough that most of the items you place in your microwave to cook are not bothered by the rack. This way you know you can keep the metal rack in the microwave oven when using it for reheating. You only need to remove it when heating or cooking oversized items. A convection microwave with a grill function can replicate the grill function of a stovetop. A microwave with a grill function in the oven works better than the standard microwave function of an appliance that is built to reheat liquids and meals and defrost foods. A convection microwave oven moves air and electrons around the food, allowing the food to become crisper. It doubles the unit's ability to create crisp crusts and breaded outer layers of meats. A microwave with a grill function cuts down on the time it takes to prepare meats and breads. The microwave grill function allows you to sear and cook the meat at the same time without significantly losing flavor or breaking down the appetizing structure of the meat, crust or breaded outer layer. Don't use the same amount of time to grill a cheese sandwich that you would to heat up a cheese sandwich. 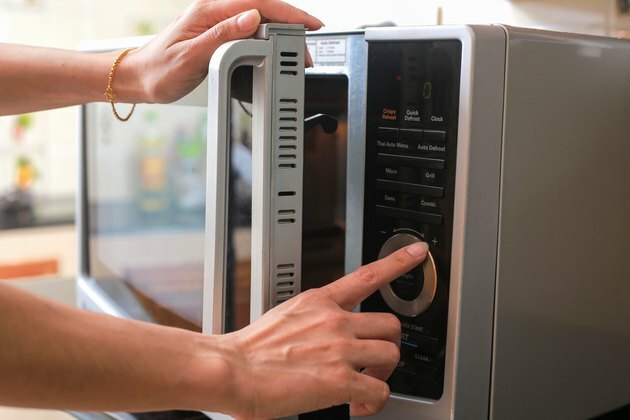 Each microwave is different and may need a few tests to figure out exactly how much time is needed to create the right amount of crisp for your specific meal. Why Does My Microwave Spark? How Does a Toaster Oven Work?